DAVID, DAVID, fur trader, businessman, and militia officer; b. 14 Oct. 1764 in Montreal, eldest son of Lazarus David and Phebe Samuel; d. there, unmarried, 30 Nov. 1824. David received his early education in the province, and then went into trade, as did his brothers Samuel and Moses. He probably wintered in the west as an engagé or a trader and established links with traders of the North West Company; in 1817 he would be accepted into the prestigious Beaver Club, membership in which was limited to prominent merchants who had wintered at least once in the interior. By 1787 he was residing in Montreal at 15 Rue Notre-Dame, where he had a wholesale and retail store; there he sold teas, spices, groceries, hardware, dry goods, crockery, and glassware. 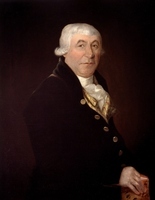 Two years later he was importing wheat from Vermont through Quebec merchant John Samuel de Montmollin. For a short period from 1793 he was in partnership with his brother-in-law Myer Michaels, a fur trader. From David’s shop they offered “a large and general assortment of Goods” and sent merchandise to Moses, who had established a fur-trade outlet at Detroit and later operated from Sandwich (Windsor, Ont.). After the dissolution of the partnership in 1795, David continued in the wheat trade, one of his suppliers being the merchant John Porteous, and the provisions business, in which he purchased powder and shot from James and Andrew McGill and Company [see James McGill*] in 1797 and 1798. He had a wide range of customers, including the military at William Henry (Sorel, Que. 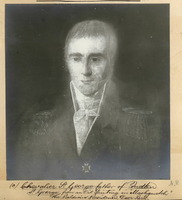 ), Sir John Johnson, superintendent general of Indian affairs, whom he supplied with goods as late as 1817, and George Ermatinger, a merchant of Amherstburg, Upper Canada, whom he supplied in conjunction with Frederick William Ermatinger. He may have engaged in brewing as well, since in 1797 he imported 1,000 pounds of hops from New Hampshire. 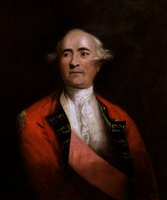 Described as a man whose probity and punctuality brought him an ever-increasing share of the Montreal retail trade, he had achieved prosperity by 1804, when he was able to pay the high price of £999 for a house in the city. By August 1806 he was renting out two stone houses on Rue Notre-Dame. David supported a number of economic demands made by the merchant community of Montreal. At the turn of the century he and his brother Samuel joined its petition to government for modification of customs regulations obliging ships bound for Montreal to put into Quebec for inspection. On 30 March 1805 he attended a dinner at Dillon’s Hotel given by merchants to honour local members of the House of Assembly who had voted against a tax on commerce to finance construction of new jails. 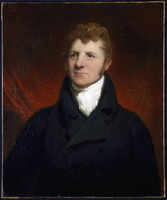 In April 1822 he was a charter member of the Committee of Trade, forerunner of the Montreal Board of Trade, formed to give merchants a stronger voice in government decisions on trade. David may have run into financial difficulties by 1806, when he had the properties of two of his debtors seized and was a trustee of the bankrupt estate of Cuvillier, Aylwin, and Harkness, a Montreal firm. In 1809 a lot with two stone houses and other buildings belonging to David, Thomas Blackwood*, and James Dow was seized at the suit of James Finlay. Eight years later Thomas Andrew Turner had the sheriff seize David’s residence on Rue Saint-Paul, a luxurious two-storey stone house, acquired from James Dunlop* or his estate, for which David still owed £2,675. David managed to keep the house, but in 1820 Turner had a lot and stone house belonging to him in the faubourg Sainte-Marie seized. Whatever the reality, David’s outward appearances persuaded Thomas Storrow Brown in 1818 that he was one of Montreal’s wealthiest and most respected citizens. 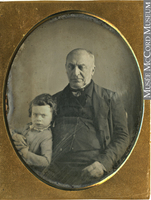 In his investments David placed himself in the vanguard of Montreal businessmen pioneering new strategies to enable the rising merchant community to undertake increasingly ambitious projects requiring huge amounts of capital and to reorient the city’s economy to the growing province of Upper Canada. Thus in 1818 he became a director of the Bank of Montreal, founded the previous year, and held that post until 1824. In late 1818 he was among a group of 14 associates who petitioned the legislature for authorization to construct a canal past the Sainte-Marie current and Lachine rapids in order to facilitate water communications with Upper Canada [see François Desrivières]. When, the following year, the Company of Proprietors of the Lachine Canal was capitalized at £150,000, David was one of seven partners empowered to sell the 3,000 shares of £50 each. He and his colleagues managed to sell only half the shares, however, and in 1821, despite significant government investment, the company failed and was taken over by a public commission. At the time David held 25 shares in it. Since at least 1802 David, like many of his colleagues in business, had been engaging in property speculation. Indeed, between 1814 and 1823 his business activities seem to have been limited largely to property transactions, investments, and loans. At his death in 1824 his estate included four extensive properties in Montreal, which were sold for £8,807, and lots in the faubourgs Saint-Laurent and Saint-Antoine. Elsewhere in Lower Canada he owned a house in Trois-Rivières as well as land in the Yamaska area and in Aston, Sutton, and Ditton townships. In Upper Canada he owned lots in Charlotteville and Walsingham townships. In most cases, the properties had been purchased at a sheriff’s sale or received in payment of debt. Money owed to David’s estate totalled more than £67,000 and included £3,378 in Bank of England annuities and nearly £7,000 in Bank of Montreal stocks. Debts of more than £10,000 were owed by Inglis and Company of London and Samuel Gerrard*, while more than £2,000 was owed by each of the firms of Gillespie, Moffatt, and Finlay of London, Moffatt and Company, McGillivrays, Thain and Company, and Desrivières, Blackwood and Company [see François Desrivières; William Finlay; William McGillivray]; even the fabrique of Notre-Dame owed £1,000. In 1825 the executors of David’s estate were still trying to recover some £52,000 owed to it by the North West Company, which had been obliged to merge with the Hudson’s Bay Company in 1821. David had obviously lived in splendid style and led an active social life. His house was furnished in cherry and mahogany, decorated with paintings and engravings, and prepared, in terms of dishes, fine glassware, and cutlery, to receive large gatherings; the silver plate alone was worth £65. His personal property was valued at nearly £400, but the modest library of 135 volumes, which did not even merit a detailed inventory, was estimated to be worth only £7. David had apparently negotiated with success a perilous era, during which Montreal, through a more diversified economy, prepared its rise from the ruins of the NWC. American Jewish Arch. (Cincinnati, Ohio), Samuel David, excerpts from a diary, 1801–49 (copy). ANQ-M, CN1-29, 4 Feb. 1789, 27 Sept. 1792, 1 March 1797 (copies at American Jewish Arch.). Arch. of the Shearith Israel Congregation (Montreal), Minute-book, 1778–80. BL, Add. mss 21877: 125–28 (copies at PAC). McCord Museum, Beaver Club minute-book; “List of subscribers towards building the Protestant parish church, 1805–14”; McCord papers. PAC, MG 11, [CO 42] Q, 24: 14; MG 24, B4, 7: 366; I61, Fanny Joseph diary. American Jewry: documents, eighteenth century . . . , ed. J. R. Marcus (Cincinnati, 1959), 111, 113–14, 429–31. Montreal Gazette, 1 Dec. 1824. Morning Courier (Montreal), 11 Feb. 1836. Quebec Gazette, 7, 25 June 1787; 28 Oct. 1790; 19 July 1792; 21 Feb., 23 May 1793; 14, 21 Sept. 1795; 25 May 1797; 15 March 1798; 18 April, 25 July, 26 Dec. 1799; 3 March, 5 May 1803; 23, 30 Oct., 6 Nov. 1806; 22 June 1809; 15 Nov. 1810; 4 June 1812; 28 March, 1 Aug. 1816; 16 Oct. 1817; 7 Dec. 1818; 12 July 1819; 13 July, 31 Aug., 26 Oct., 23 Nov. 1820; 18 Jan., 24 May 1821; 25 July, 29 Aug., 31 Oct. 1822; 2 Jan., 13 Feb., 17 April 1823. Officers of British forces in Canada (Irving), 165. Quebec almanac, 1805–24. F. W. Terrill, A chronology of Montreal and of Canada from A.D. 1752 to A.D. 1893 . . . (Montreal, 1893). T. S. Brown, Montreal fifty years ago (Montreal, 1868), 20. Denison, Canada’s first bank, 1: 122. Solomon Frank, Two centuries in the life of a synagogue (n.p., n.d.). The Jew in Canada: a complete record of Canadian Jewry from the days of the French régime to the present time, ed. A. D. Hart (Toronto, 1926), 24–26. B. G. Sack, History of the Jews in Canada, from the earliest beginnings to the present day, [trans. Ralph Novak] (Montreal, 1945). G. J. J. Tulchinsky, “The construction of the first Lachine Canal, 1815–1826” (ma thesis, McGill Univ., Montreal, 1960), 10, 36. E. I. Blaustein et al., “Spanish and Portuguese Synagogue (Shearith Israel), Montreal, 1768–1968,” Jewish Hist. Soc. of England, Trans. (London), 23 (1971): 111–41. Elinor Kyte Senior in collaboration with James H. Lambert, “DAVID, DAVID,” in Dictionary of Canadian Biography, vol. 6, University of Toronto/Université Laval, 2003–, accessed April 24, 2019, http://www.biographi.ca/en/bio/david_david_6E.html.